My predecessor Hardik had reviewed the HP Spectre x360 in October last year. In his review he had mostly good things to say about the premium convertible laptop. In particular, he spoke highly of the Spectre x360’s solid build and tasteful design. This year, the x360 convertible laptop in question is not a Spectre but a Pavilion. 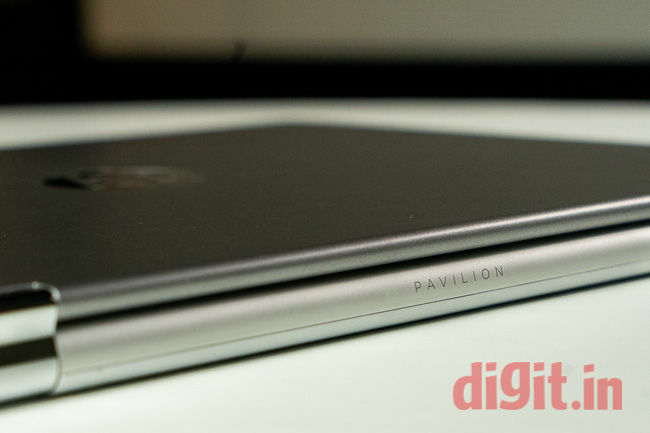 Many of us already know that Pavilion is HP’s Home and Home Office range of laptops and desktops. Pavilion machines are generally reliable and cost-effective. So, that should mean that the Pavilion x360 should have the same convertible advantage from last year’s Spectre x360 while retaining those fine Pavilion qualities, yes? Let’s find out if it does. The lid of the Pavilion x360 has a matte metal finish that lends the laptop a clean, premium look. In the middle there’s a big HP logo with a chrome finish. The base is made of plastic and is mostly bare, except for four rubber feet and some tiny holes for heat dissipation. At 1.6 kilogrammes, this convertible feels heavy to lift and carry around, especially in one hand. I imagine it would’ve been noticeably lighter if it weren’t for the 2.5-inch hard drive inside it. 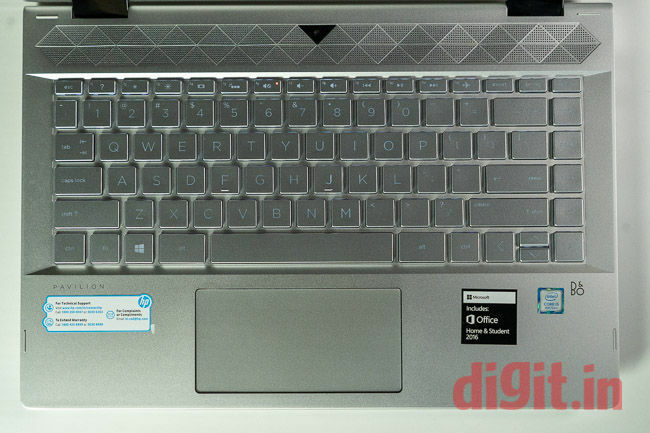 Like the HP logo on the lid, the two display hinges on either side of the display have a chrome finish. Personally I’m no fan of chrome finishes on electronics; they remind me of large, gaudy grilles on Honda and Toyota sedans and bathroom fixtures. But these shiny hinges are about function as much as they are about aesthetics; they fold back all the way into tablet mode, putting the 360 in the name. HP claims the hinge has been tested 25,000 times for openings and closings and 7,000 times for 360-degree folds. The display opens up easily with one finger but wobbles a bit in all open positions. Gentle shakes don’t cause the display to flap about but a sharp lift of the base does cause the display fall in the direction of gravity. The piano-black bezels are slim on the sides of the 14-inch display (5.35mm-slim to be specific) but not so much at the top and bottom. The area above the keyboard is dedicated to a speaker grille that’s even larger than the one on last year’s Spectre x360. The holes for the speakers now look more funky in shape and texture. While the keyboard remains full-size, the touchpad has become shorter in height to accommodate the speakers above. Pressing down hard on the keys of the keyboard reveals some flex on the hard plastic body. Construction on the whole is good on the Pavilion x360, given its price. The unit I received for review was accompanied by the HP Pen stylus. I thought it looked and felt similar to the Surface Pen Microsoft sells but was a little more rough around the edges. No, really—the sharp edges of the Pen’s clip cut into my fingers continually. It was otherwise well designed. It had one button for erasing and another for selecting. Both were well-placed and easy to press. The HP Pen swallowed a single AAAA battery before beginning to work on the Pavilion x360’s display. The Pavilion x360 comes in two display sizes: 14 inches and 15 inches. However, the model I received for review was the 14-inch one. The display on it is a Full HD IPS panel with a glass coating. 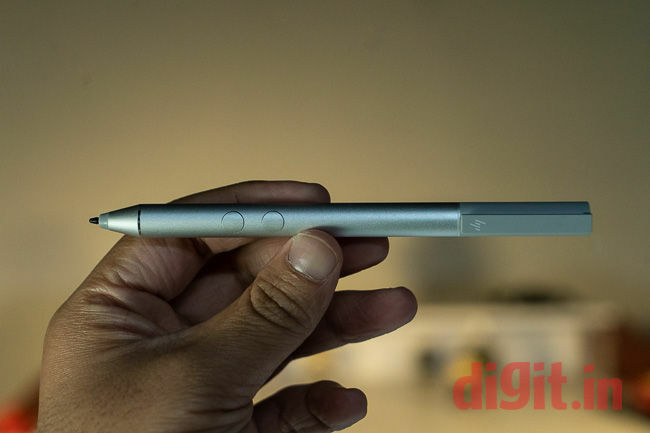 Naturally, it is a touchscreen with support for multiple fingers and styluses like the HP Pen. Colours appeared vivid on the 14-incher even though the Spyder4Elite Test revealed only a 63-percent coverage of the sRGB colour space and a 47-percent coverage of the Adobe RGB colour space. The screen was bright enough for most indoor and outdoor areas, like conference rooms and sunny balconies. Touchscreen input was a little jittery while scrolling up and down web pages initially but smoothed out with more regular touches. I’m guessing this is due to an internal power-saving feature. Stylus input with the HP Pen was mostly a pleasant experience. Strokes using the stylus appeared accurately on the screen with no noticeable latency. What threw me off a bit however, was the large gap between the glass surface and the screen inside; it made the writing and drawing experience a little less natural. Palm rejection worked accurately three out of five times. Whenever it didn’t, the on-screen keyboard or the context menu would deploy automatically. I later discovered that resting my palm on the screen after making an input with the stylus first reduced the number of accidental palm inputs significantly. Summing it up, I’d say that the writing and drawing experience on the Pavilion x360 isn’t as naturally accurate as what you’d get from say, a Microsoft Surface Pro, but it’s definitely not far behind. With the help of the HP Pen, the Pavilion x360 is sufficient for when you need to jot notes down quickly or mark a section of a page in a hurry. The speaker grille on the Pavilion x360’s body is unmissable, but the audio output from it is—for want of a better term—missable. 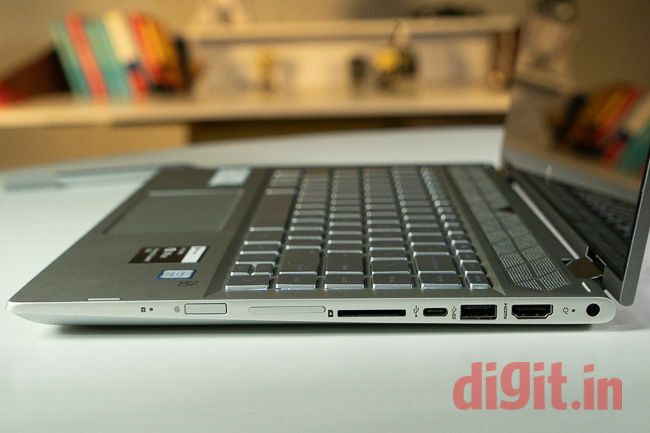 It sits right above the keyboard as one thick, textured strip and spans almost the entire width of the laptop. While audio from the dual speakers inside is loud enough to cut through a noisy conference room full of murmuring voices, it lacks bass completely. Music sounds blunt and even tasteless on the Pavilion x360’s speakers. Despite boasting of technologies like HP Audio Boost and custom audio tuning by experts at Bang & Olufsen, the Pavilion x360 fails to leave an impression on the listener’s mind. The equaliser adjustments available on the B&O Audio app do little to change the overall audio quality. The multi-stream option available on the app is too difficult to figure out as well. Therefore, the audio setup on the HP Pavilion x360 is best reserved for voices and high frequencies. HP has not been close-fisted with IO ports on the Pavilion x360: on the left side, we see a USB 3.1 port and a 3.5mm audio jack for headsets. We also see the power button and a Kensington lock port. On the right side, we see the power port, a full-size HDMI port, another USB 3.1 port, a USB Type-C port, and a memory card reader slot. We also see a volume rocker and a fingerprint scanner. 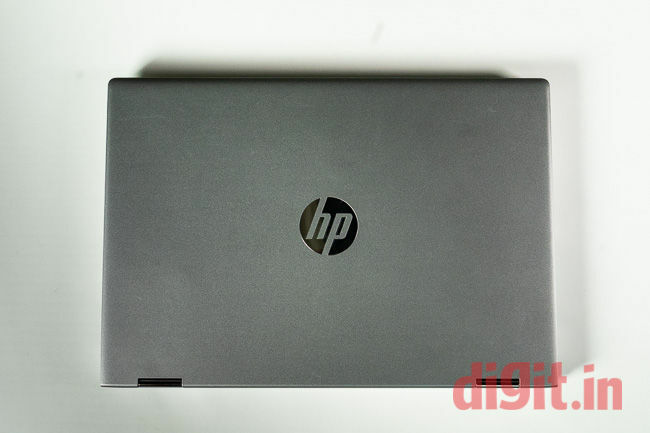 HP has thoughtfully placed the power button and the fingerprint scanner on the sides of the laptop so that the laptop can be powered on and accessed even when it’s held in tablet mode. Placing the volume rocker on the side is a convenient touch too. In my experience, the fingerprint scanner scanned swiftly and accurately four out of five times. The keyboard on the HP Pavilion x360 does some things right but some other things, completely wrong. For example, the letters on the keys are really big, so the keys easily recognisable from a distance. On the other hand, the F-keys are altogether too tiny for my liking. Then there’s the colour mismatch problem: the letters and symbols on the keycaps are white, but so is the backlight beneath them. So, when the backlight is turned on in only slightly dim environments, the white colour of the backlight blends with the white colour of the keycaps and makes markings on the keycaps utterly unrecognisable. The backlight also has no brightness control. So, there are two ways of overcoming this problem, if you ask me: turn the keyboard backlight off and strain your eyes some more, or move yourself to a darker environment so the backlight can be effective. Using light text against a light background is a bad idea. It reminds me of an old Honda City that had a similar colour combination for its instrument cluster; it annoyed the daylights out of me (pun unintended). The keys on the Pavilion x360’s keyboard are otherwise easy to use. They were a tad too soft for my taste, but I got used to them easily enough. On this review unit, the left Alt key alone was sticky and adamant. They’re all well-placed on the keyboard and have ample travel as well. There are dedicated keys for Home, End, Page Up, and Page Down functions, which is convenient for text manipulation. The touchpad on the Pavilion x360 disappoints by virtue of not being a precision unit. Instead it uses a proprietary HP driver and an inbuilt HP touchpad utility to control taps and swipes. That it is not a precision touchpad is made apparent in the first five minutes of using the touchpad; movements of the mouse pointer feel less natural and smooth. That said, the touchpad is not bad for everyday use. Clicks feel sure and soft. Its height is reduced significantly by the speaker grille that sits above the keyboard. On the performance front, the HP Pavilion x360 is a clear winner. 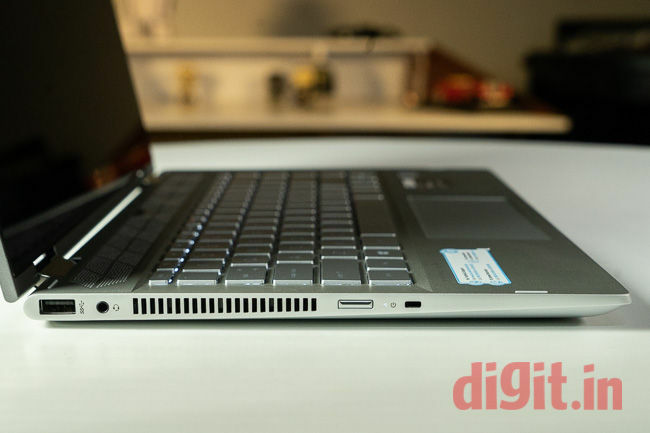 The review unit had an Intel Core i5-8250U CPU, 8GB of RAM, and an integrated Intel UHD Graphics 620 UHD GPU. Storage was handled by a SanDisk 128GB SSD in conjunction with a Toshiba 1TB hard drive. On benchmark tests, the Pavilion x360 scored splendidly. 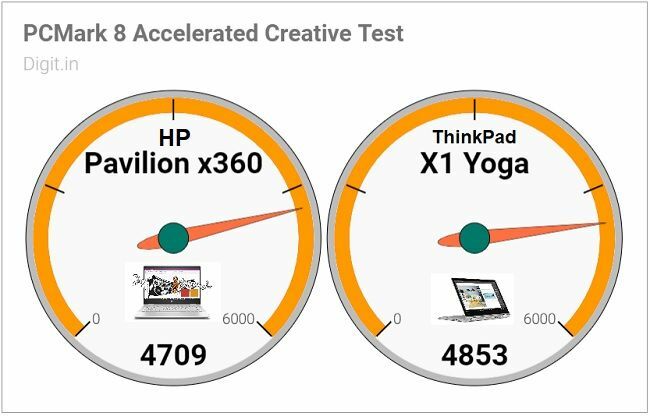 It scored 4709 points on PCMark 8’s Accelerated Creative test, which is only 144 points lower than the third-generation Lenovo ThinkPad X1 Yoga’s score. Mind you, that’s a convertible laptop that costs nearly twice as much as the Pavilion x360. 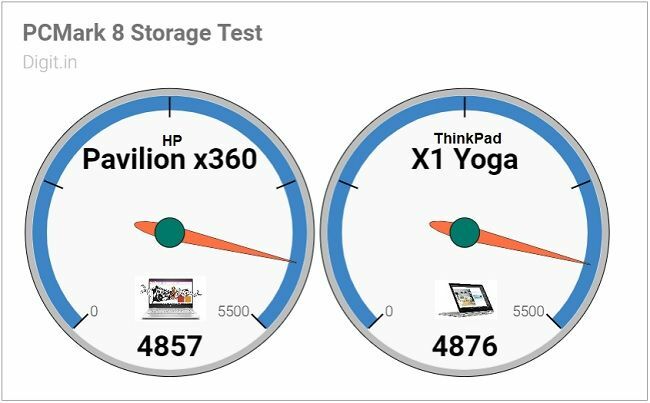 On PCMark 8’s Storage test, the Pavilion x360 scored 4857 points, which is only 19 points below the ThinkPad X1 Yoga. In real-world use, the HP Pavilion x360 performed just as well. It showed no signs of struggle when there were over half a dozen applications open and one of the Chrome tabs was playing a video. Switching between applications too was smooth and free of lag or stutter. Where the HP convertible struggled was in the graphics department. Without a dedicated graphics card, there was perceptible lag in some in-window animations and video playback. Going through the BIOS screens revealed that the Pavilion x360 had two SO-DIMM slots for RAM. This means that the RAM on-board can be upgraded in the future. That’s a nice touch without any doubts. What’s not nice is the way HP is filled this laptop up with bloatware. The taskbar’s tray is strewn with HP proprietary utilities: HP Audio Switch, HP JumpStart, HP CoolSense, etc, but thankfully, they can all be uninstalled in case you want to free up some space. All in all, performance on the HP Pavilion x360 is definitely good considering its price tag. On the battery benchmark test, the HP Pavilion x360 lasted 3 hours, 5 minutes. During the time I had it, the Pavilion x360 lasted well over 6 hours with mixed usage. For the tests, I had Bluetooth and Wi-Fi turned on, set the brightness to about sixty percent, and ran over six applications simultaneously, including Google Chrome and File Explorer. When I played YouTube videos on battery for two and a half hours straight, the battery dropped from 100 to 55 percent, which is understandable, given the load. All in all, a six-hour battery life is acceptable from a laptop of this price range. However, a slightly longer battery life would have been much appreciated and welcome. The HP Pavilion x360 can be looked at as an ideal entry-level model into the convertible laptop world. It’s almost got the same features as a high-end convertible like the ThinkPad X1 Yoga but lacks the sophistication. But that’s alright, because it’s definitely got the basics right, like touch input, performance, and battery life. If you’d like a word of advice, I’d say get the HP Pavilion x360 in a darker shade if it's available. That way, the letters on the backlit keyboard will be more recognisable as the keycaps will be dark. Also, the chrome hinges will stand out better against the dark body.